This post contains MCQs of Computer Science with Answers for NTS, PPSC, CSS, FPSC, OTS, PTS Online Test and Interview Preparation. This is the 9th Part of Computer Quiz Series. MCQs are taken from Caravan Comprehensive GK book. Go Here for more Solved Multiple Choice Questions on Computer Science. The counting of MCQs is starting from 131. For previous Set of computer mcqs Go Here. 131. Which is the biggest company of Computer software in the world? 132. Algol, Basic, Cobal. 4GL, 3GL, Java, Pascal, C, C++ and VB are all _________. 136. Alan Mathison Turing and John Von Neumann are related with? 137. The time required for a computer to locate and transfer data is called? 138. A device which encodes character by the depression of keys is known as_____. 139. The area inside a computer frame and auxiliary storage where date and instructions are stored is called________. 140. An extremely small piece of silicon on which integrated circuits are implicated is called______. 142. A bite is a group of how many bits? 144. Four bibles are equal to how may Bytes? 145. Which is the smallest unit of memory? 146. One kilobyte is equal to how many Bytes? 147. One Megabyte is equal to how many Kilobytes? 148. What is internet terminology, does SMTP stand for? 149. What is internet terminology, does FTP stand for? 150. Who invented the digital computer? 151. A smaller, faster memory which stores copies of data from the most frequently used main memory locations is known as ________. 152. The process of locating and Wing or bypassing errors in computer program code or is called _____. 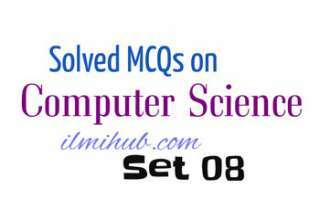 Visit This to start from the first post of MCQs of Computer science. All the MCQs of Computer Science are posted here carefully but if you find any mistake, inform us in the comment section.